The Facebook foreign policy experts and the Left news are going nuts trying to protect Clinton and Obama. It now seems the North Korean nuclear deal was just a “framework” that the international community could build on. What does that mean? North Korea admitted to starting its nuclear program to simply create nuclear weapons in 2002. President Billy Bob knew about this before his speech. He also knew that the reactor being built was not connected to the power grid and had NO intention of being used for power. Interestingly enough, Clinton structured the deal in such a fashion that it didn’t require ratification by the Senate. (Obama used this same strategy for his Iran deal). The Obama Administration considered it a lost cause and spent no real time on it, calling the strategy “Strategic Patience.” How did that work out? While he was strategically being patient, the North Koreans perfected its nuclear technology, including uranium enrichment and missile technology. Some insiders from both the Obama and Clinton Administrations say they knew North Korea was cheating but planned to “use the information for leverage at the UN.” I don’t even know what that means. And in another Clinton moment akin to “I did not have sexual relations with that woman” he ends with; “Today all Americans should know that as a result of this achievement with North Korea, our Nation will be safer and the future of our people more secure.” The above words should terrify you! Nothing in this North Korean agreement happened. NOTHING! The North Koreans, the Russians, and Iranians may be the most dangerous trio on the planet! Now this gets better, because you see, Clinton didn’t do this all alone. He asked someone, who at that time had the biggest failed presidency in US history, Jimmy “The Racist” Carter to go negotiate with them to back off the nukes. Jimmy gave them $5 billion in aid and 2 new reactors for power! Clinton hailed this as one of the greatest achievements in assuring peace on the Korean Peninsula, so much so, that Mr. Carter was given a Nobel Peace prize for it! An interesting note… The Left makes a VERY big deal of the fact that President Trump said he would be “honored” to meet Kim Jong Un. But had no problem with EX-President Jimmy Carter saying that “Kim II Sung wanted my respect and I am going to give it to him.” Remember he got a Peace Prize! Enter President Obama who said he would “Never accept a nuclear North Korea.” I guess, as all the loons on the Left claim, this crisis has come about ONLY while Trump has been president. Wow! The North Koreans have come all this way in 8 months! Let’s see how many of you Obama worshippers can be honest with yourself. Among his many lies, you know, you can keep your doctor or your policy or well, most everything. He promised. After saying he wouldn’t accept a nuclear North Korea and after they launched many missiles and after they tested many nuclear bombs, what did he do? What effective action did Obama take against North Korea? If you said NONE you would be correct! He did nothing. It’s been escalating since 2015 and I’m sure he prayed to himself that no bombs would be lobbed until he was out of office! Understand that focusing on North Korea, and NOT including Iran in any solution we come up with, just puts us back on track to have this happen all over again in about 10 years. They have continued to enrich uranium. Not supposed to. They have continued nuclear testing. Not supposed to. They have continued missile testing. Not supposed to. They have continued to lie and deceive us. Not supposed to. And we have continued to do nothing of substance. The eloquent and ever-wise Congresswoman Maxine Waters states her concern that if North Korea launches a nuclear attack on the U.S. she’s afraid Trump will get us in a nuclear war! As if that statement isn’t scary enough, she wants to run for President. We have tried diplomatic measures for years. We have paid them. Given them FREE fuel. And much more, to no avail. North Korea’s actions show a total contempt for anyone or anything but North Korea. To allow them to continue along the path they have chosen would mean we allow them to, at minimum, hold the whole area hostage to the whims of their sick little dictator. Remember… he believes himself to be a god! Handling North Korea the same way we have for decades is nothing shy of insanity! President Trump was elected to conduct business in a different way. To actually protect us. To actually speak for the people. I’m thinking a new Great Lake is in the making. Lake North Korea! Previous articleLabor Day? or Happy American Dream Day! 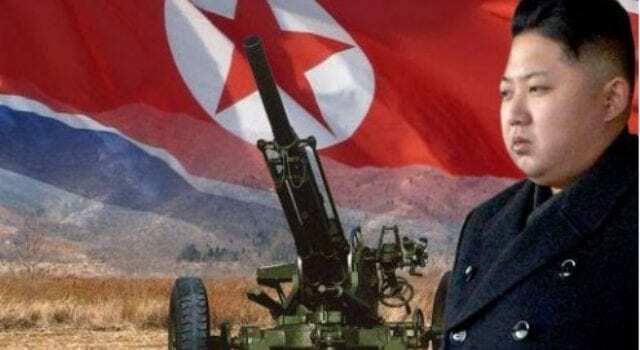 Next articleIs North Korea is ‘begging for war’ !